Respectable society of nineteenth century Colorado gave women little leeway when it came to supporting themselves. Women who strayed from the accepted norm of the day soon found themselves outcasts, doomed to find their way to the bars and brothels of the West. Many of these fallen women became dance-hall girls, prostitutes, and madams - and a few adopted the lifestyles of gamblers, robbers, and rustlers. 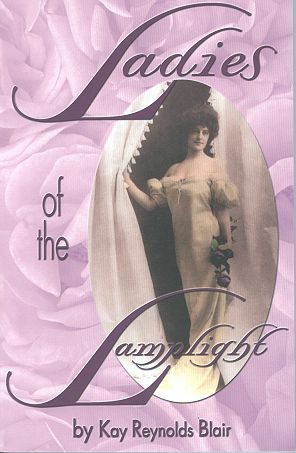 Ladies of the Lamplight tells the stories of some of these infamous women - Silver Heels, Poker Alice, Cattle Kate, Etta Place, Mattie Silks and Mollie May, to name just a few. This revised edition has been expanded to include more women whose stories continue to captivate us and hold our attention into the wee hours of the night. Any woman of the day who did not adhere to society's rigid standard of behavior was scorned in those days and labeled as "fast," "easy," or a "fallen woman." Women who were kept or were mistresses were ostracized; yet men who kept women, who were womanizers or frequented prostitutes, were accepted by their peers and continued life as usual. Ladies of the Lamplight explains the morals and the hierarchy of the Victorian times. Kay Reynolds Blair was born and raised in the South and moved to Colorado in 1966. She has a Bachelor's Degree in English and Art and has done postgraduate work in Music, Education and Marketing. Ms. Blair worked for a national publisher as a copy editor, has written nonfiction articles, and coauthored a book on American literature. She has two grown children and lives with two spoiled cats.